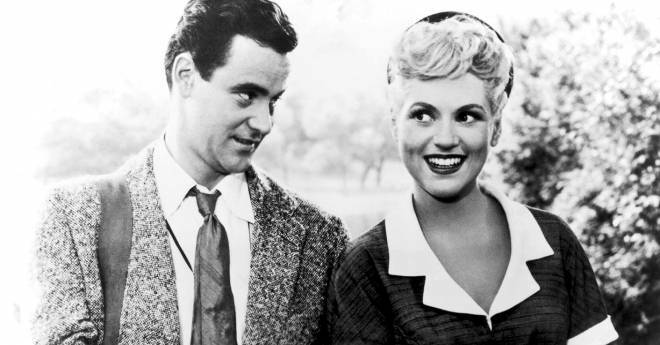 If you remember Judy Holliday, you would know there was really no one like her. She only did a handful of movies, but was simply unforgettable on stage, on screen and in person. She was acting for a few years when she got the role of Billie Dawn in the Broadway debut of Garson Kanin’s play, Born Yesterday. Garson Kanin and his wife, writer/actor Ruth Gordon were very good friends of Katherine Hepburn and Spencer Tracy and they came and saw her in the play and thought she was wonderful. Katherine felt duty bound to get this actress noticed on the silver screen in the film adaptation of the play, and Judy badly wanted to recreate the part in the movie, but the rights were purchased by Columbia Pictures, and production chief Harry Cohn, thought Judy to be a “fat, jewish broad”. Garson Kanin was going into production on a movie of his own, written by himself and his wife Ruth Gordon. 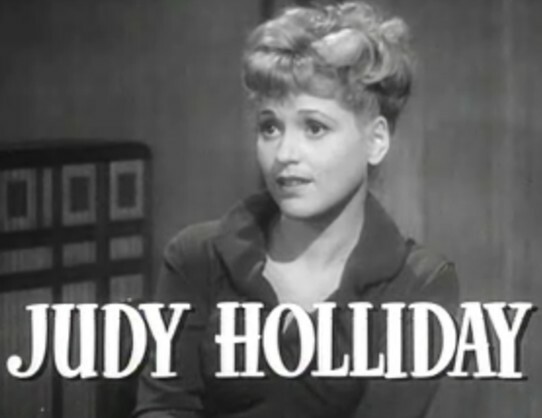 When Garson Kanin complained about Cohn’s opinion of Judy to Katharine, she suggested casting Holliday as Doris Attinger in his movie. 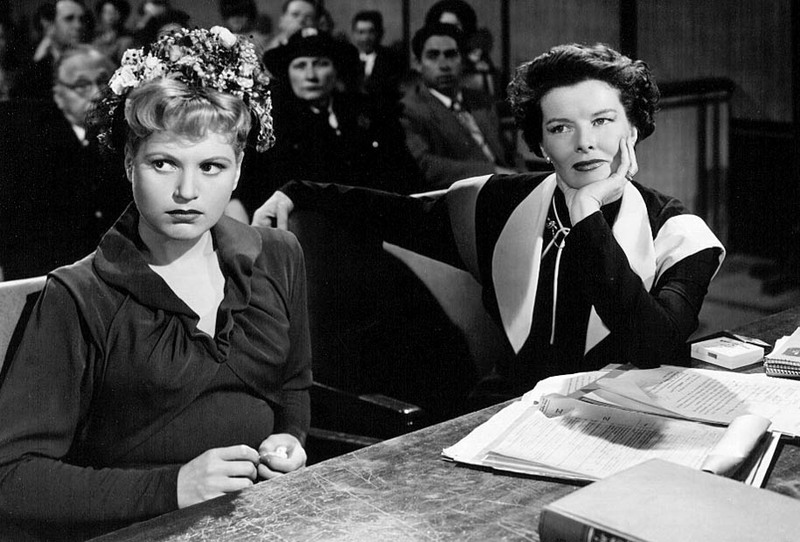 Doris Attinger is the attempted murderess on trial and defended by Katherine Hepburn’s Amanda Bonner in what became one of my all time favorite films, Adam’s Rib in 1949. She literally does steal the show, thanks to the likes of Katherine and her onscreen husband, Spencer Tracy who plays the prosecutor Adam Bonner, but she turned down the role at first. Finally Hepburn got the real reason out of her. Sensitive about her weight, Holliday didn’t want to be called “fatso” on screen, as written in the script they had given her. Hepburn assured her that the Kanin’s would gladly rewrite the line: “They’re writers. They know lots of words.” Finally, Holliday agreed. Later she insisted that the word “fatso” be restored because it was the best way of playing the scene. This film was her big break, but it didn’t change the fact that she was going to be sharing the screen with two legends. 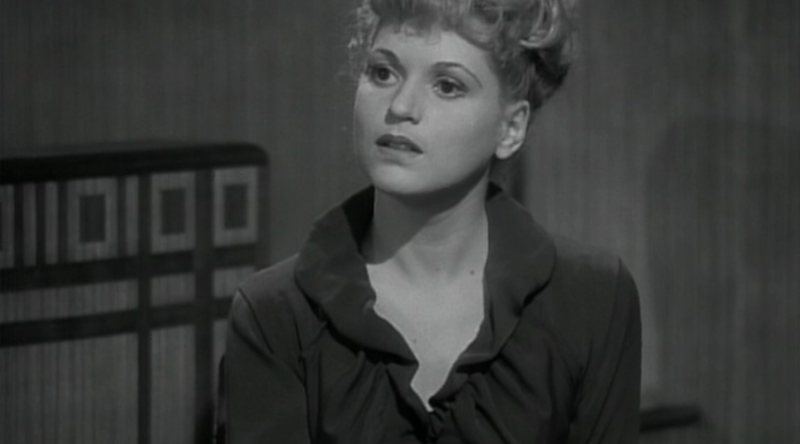 In her early monologue scene with Katharine Hepburn, Judy Holliday can be seen trembling. This was not acting, but nervousness. The inexperienced Judy Holliday was terrified of performing with Katharine Hepburn. But she soon realized that Katherine was Judy’s biggest fan. To help build up Judy’s image, particularly in the eyes of Columbia Pictures chief Harry Cohn, Katharine reportedly urged director George Cukor to focus the camera on Judy during a number of their shared scenes, and Katharine deliberately leaked stories to the gossip columns suggesting that Judy’s performance in Adam’s Rib was so good that it had stolen the spotlight from Hepburn and Tracy. 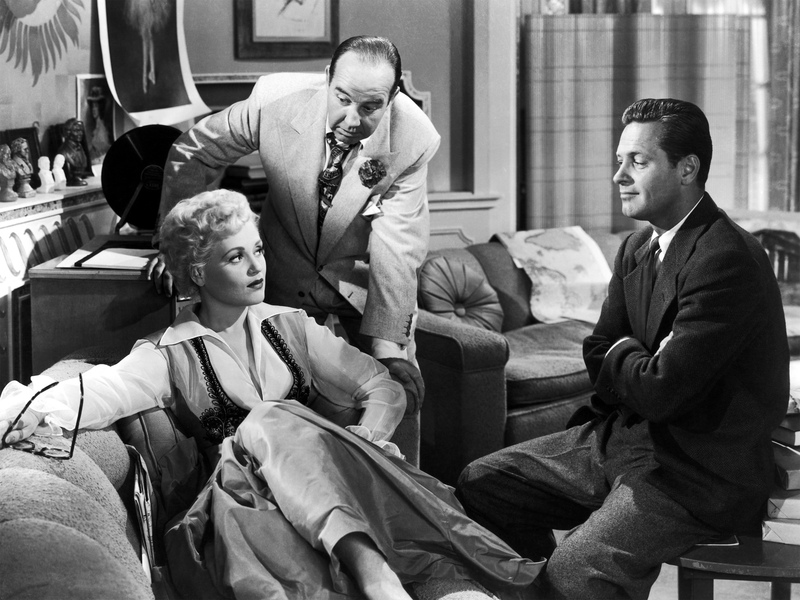 This got Cohn’s attention and Holliday won the part in Born Yesterday (1950), also directed by George Cukor. This to me is a great example of what a great friend Katherine Hepburn could be. Hepburn would later explain her generosity to Kanin: “It was the kind of thing you do because people have done it for you.” Garson Kanin, by the way, would go on to write a fantastic book about Hepburn and Tracy called “Tracy and Hepburn: an Intimate Memoir”, published in 1971 by Viking Press. Regarding Born Yesterday, there’s even more to the story that makes this that much more sneaky. Apparently, Garson Kanin claimed that he modeled the part of the obnoxious junk dealer Harry Brock after Harry Cohn, but that the studio chief never realized it. Kanin sold Born Yesterday to Columbia Pictures for $1 million, setting a record for the highest price ever paid for a film property. In his autobiography, Kanin wrote that Cohn paid the record $1 million for the films rights because he had heard that Kanin said he “wouldn’t sell the rights to Harry Cohn for any amount – not even a million dollars.” The part of Billie Dawn was originally written for star Jean Arthur and even hired to play the role on Broadway, but left during tryouts and was replaced by Holliday. Judy would go on to win the Golden Globe and the Oscar for her performance in the film. Jean Arthur never won an Oscar. Lemmon and Holliday would go on to act together again in 1954 on Phffft (terrible title…how do you tell people what movie you just saw?). 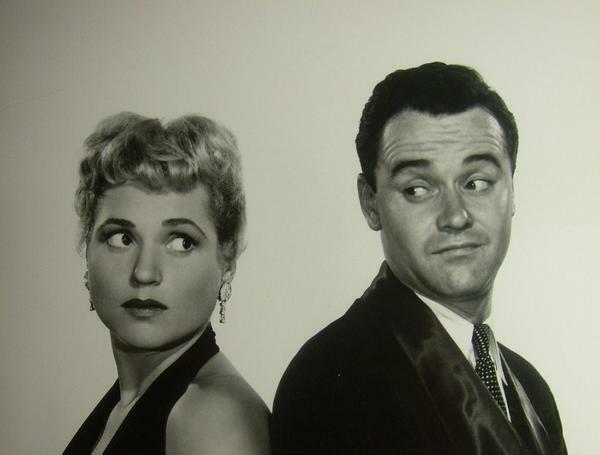 Jack Lemmon had become a fan and admirer of Holliday’s, just as Hepburn had. He would later go on to say of her, “She was intelligent and not at all like the dumb blonds she so often depicted. She didn’t give a damn where the camera was placed, how she was made to look, or about being a star. She just played the scene — acted with, not at. She was also one of the nicest people I ever met. She was hardly the dizzy blonde. If she were alive today, she would’ve zipped right through the Mensa puzzles. 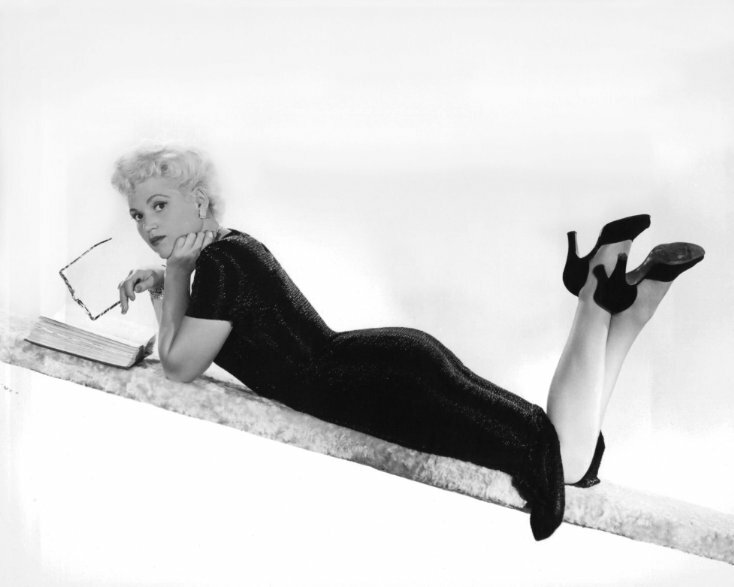 ” She was reported to have an IQ of 172, even though the characters she played onscreen were all dizzy blondes. She often said that it took a lot of smarts to convince people that her characters were stupid. According to biographer Gary Carey, in its search for subversives in the film industry, the House Un-American Activities Committee was flummoxed by Holliday. She essentially playing her Billie Dawn character on the witness stand. She ended up being the only person ever called before HUAC who was neither blacklisted nor compelled to name names. She continued doing movies, sparingly after the trials, but preferred the stage. 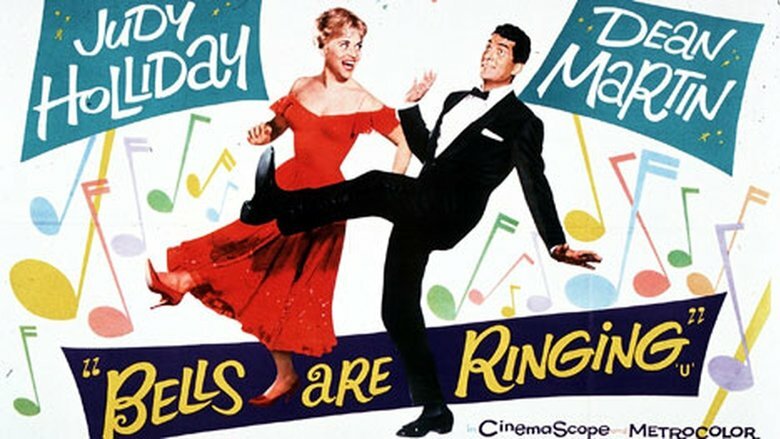 She would go on to win Broadway’s 1957 Tony Award as best actress in a musical for Bells Are Ringing, a role that she recreated in the film version of Bells Are Ringing (1960) along with Dean Martin. The music in the film is amazing. She proved to have a flawless singing voice and even released a few albums, during this time to join the broadway albums she performed in. In October 1960, Holliday started out-of-town tryouts on the play Laurette based on the life of Laurette Taylor. The show was directed by José Quintero with background music by Elmer Bernstein and produced by Alan Pakula. Unfortunately, Holliday became ill and had to leave the show. It closed in Philadelphia without opening on Broadway. She had throat surgery shortly after leaving the production in October 1960.